In this powerful and moving biography of one of the greatest labor leaders in the history of America, students come face-to-face with an inspirational man whose trials and tribulations echoed the struggles of modern America and whose courage, simplicity and faith changed agriculture in America forever. Paperback, brief, and inexpensive, each of the titles in the "Library of American Biography" series focuses on a figure whose actions and ideas significantly influenced the course of American history and national life. In addition, each biography relates the life of its subject to the broader themes and developments of the times. This text focuses on Chavez, but also provides the much needed background of the farm workers movement, the formation of the UFW and the history of migrant workers in the U.S. 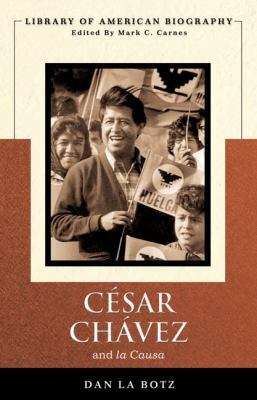 This text incorporates the latest scholarship on Chavez' s life and times, but makes the story accessible to students in both survey and upper division courses in American history.La Botz, Dan is the author of 'Cesar Chavez and la Causa ', published 2005 under ISBN 9780321187642 and ISBN 0321187644. Loading marketplace prices 6 copies from $3.72 How does the rental process work?